If you can believe it, about a year ago we launched Tableau 7.0, unlocking the ability to easily make filled-maps, area charts and a host of other great features. In the near future, we're going to release Tableau 8.0, which has its own host of new tricks. We'd like to introduce them to you in our 'New in 8' series. In this series, we'll show off some vizzes built with Tableau 7.0, but rethought using 8.0's features. One huge upcoming feature is the ability to make objects on dashboards free-floating. That means you do not have to use the old grid layout—though you can if you’d like. 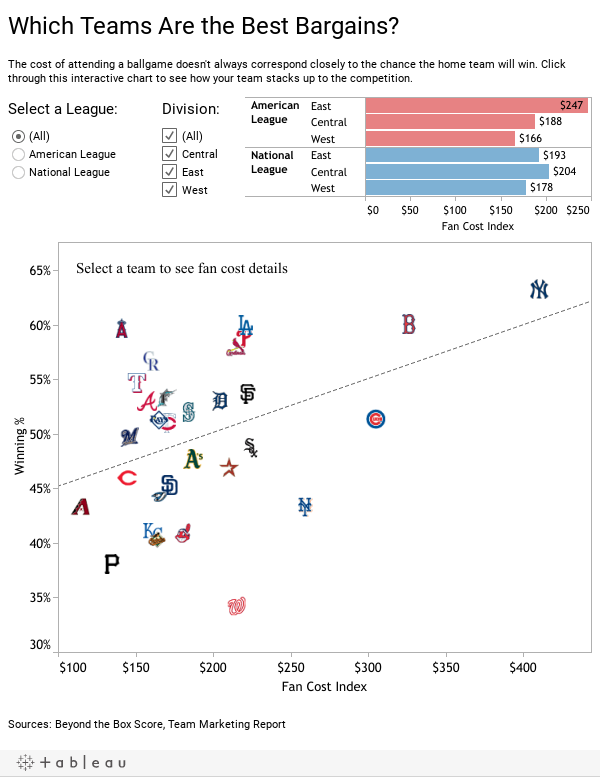 Here's an example, using this old viz about the cost of various Major League Baseball teams. Take a look, and then check out my "8.0" take on it. The story is about showing which teams have the highest winning percentage and the highest fan cost index. In the default year shown, the New York Yankees really stand out. Having so many views (particularly the text table on the bottom) takes away from this initial view. But that information is still useful. Conveniently though, we have a lot of blank space in the scatter plot where there’s no information. This gives us space to put in new information when you click on a team. The FCI is really the call-out piece of data, so why not make the number bigger? But, that number is more powerful when you know where it falls along the scale to other teams. It’s a bit hard to tell on the scatterplot (scatterplots are for correlations, not direct comparisons), and there’s not enough space for a full bar chart at the bottom. So, why not add it to my little blank space of information? All of this is possible with 8.0. With the new dashboard tools, you can place a view, legend or even filter anywhere on a dashboard. Even on top of other views. This feature continues Tableau Public's simple drag-and-drop functionality. Freeform dashboards will open up a lot of opportunities for the Tableau Public community. This is just one simple example, and I can’t wait to see what authors come up with. Great. But the table in v7 did allow you to Ctrl-Select more than 1 team and make a direct comparison between teams; your new table does not have that feature and so the new version is lacking in that regard. Hi Mike, thanks for the comment. It's true, this new version does lose out on that comparison. In a real scenario, the author would need to find where to put the priorities in their viz. Using floating dashboards requires some extra thought, and it might even be possible to incorporate the direct comparison had I thought about that.